[2/15/2015, 11:31:14] Error 0x80004005: Failed to extract all files out of box container #0. For those organizations that do not have any 32-bit operating systems (good job! ), the default installer can be used successfully, but it’s necessary to force the install program out of the native environment and use Windows on Windows. Then ensure the “Run installation and uninstall program as 32-bit process on 64-bit clients” box is checked. Checking this box will work around the extraction errors. Unfortunately, the above workaround is only applicable for 64-bit devices. To handle both 32-bit and 64-bit operating systems, the files need to be extracted to remove the broken installer from the equation. The 64MB installer from Microsoft extracts to over 1.6GB. If that is too large (especially for devices without a local distribution point), create a self-extracting archive with 7-Zip to get things back to a reasonable size. Not only will this reduce the size again, but it will also reduce the overhead and time that comes with trying to download and hash check hundreds of files (think AudoDesk). The resulting .exe file should get it back down to about 280 MB which is still big but much more reasonable. In this example, the folder, “\cmsourceMicrosoft .NET Framework 4.5sfx“, is used as the content source for the deployment type, so the self-extracting archive .exe. can be moved there. REM Installs the .NET Framework after extracting the files. 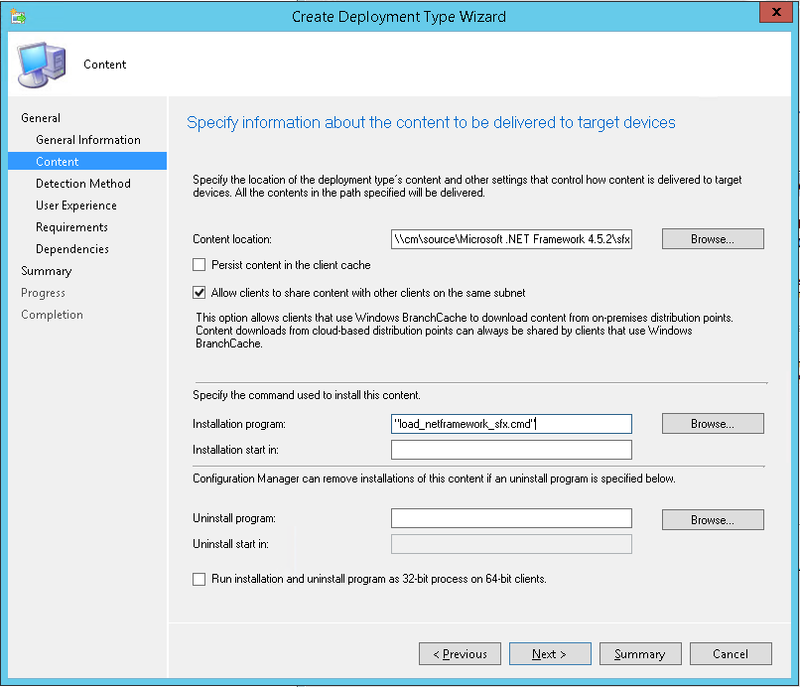 Regardless of which install method used, Microsoft prescribes a method for determining which versions of the .NET Framework are installed on a device. Since future versions within the .NET 4.0 branch will be backwards compatible, don’t worry about downgrading users to an older version. If in six months someone has .NET Framework 4.6 installed, that will satisfy the prerequisite, so simply let the detection rule succeed. For the detection method, check that the HKEY_LOCAL_MACHINESOFTWAREMicrosoftNET Framework SetupNDPv4Full key has a Release value greater than or equal to 379893 to show the .NET Framework 4.5.2 or above installed. It’s recommended to not specify any requirements for using this one deployment type unless Windows XP is in the environment. 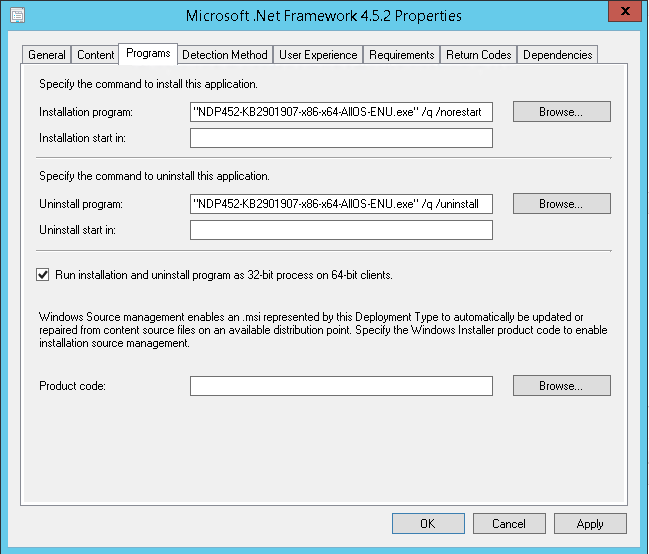 It is ideal for later operating systems to at least leverage the detection method of this application’s deployment type to show at least .NET Framework 4.5.2 installed to handle the prerequisite scenario. This means that if Windows 10 comes out and has .NET Framework 4.6 installed, any “pre-reqs” of .NET Framework 4.5.2 should evaluate and be ok having the later version within the .NET 4 branch installed. The conclusion should be an application for installing the .NET Framework 4.5.2 which works on both x86 and x64 devices in and out of task sequences.